It's almost here, the event that we've all been waiting for. 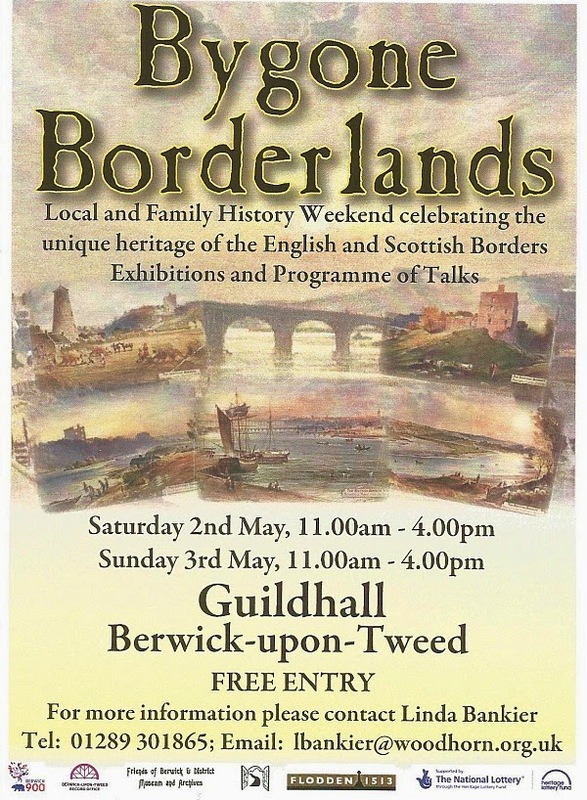 The popular annual Bygone Borderlands event at Berwick Guildhall is this weekend; from 11am to 4pm on Saturday, 2 May and Sunday, 3 May. Pose your family history question to us or Northumberland and Durham Family History Society. Discuss those local history puzzles with Ayton Local History Society; Belford Museum Group; Border Archaeological Society; Bowsden History Group; Chirnside History Group; Coldstream History Society; Eyemouth Museum; Flodden 1513; Friends of Berwick & District Museum and Archives; Glendale Local History Society; Lowick Heritage Group; Northumberland and Durham Family History Group; Old Parish of Bamburgh Group ; Till Valley Archaeological Society (Tillvas). There's a downloadable programme of talks - 4 each day, starting at noon.